Hi everyone – it’s Stacey from Glued To My Crafts sharing a crafty idea that will make the back to school season extra special! 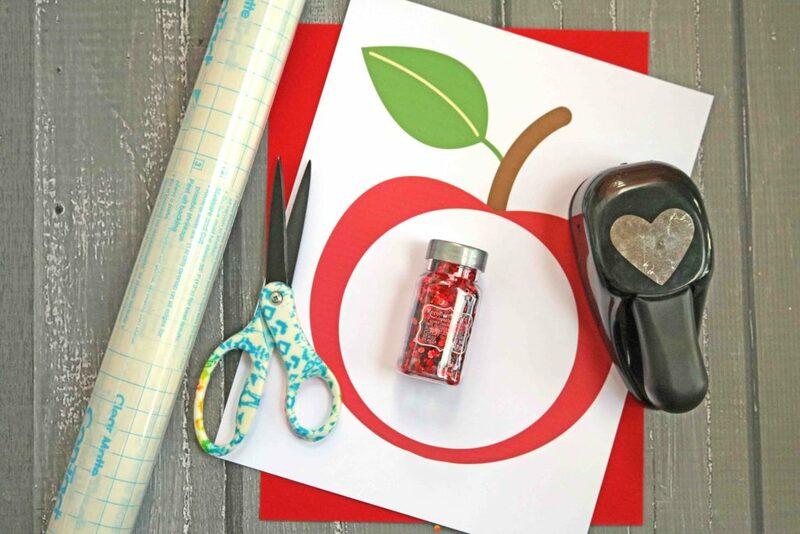 This apple-themed DIY project encourages you and your child to get crafty together, while you make some awesome memories along the way. Then take your finished pieces and display them on your window or wall, to enjoy all month long. 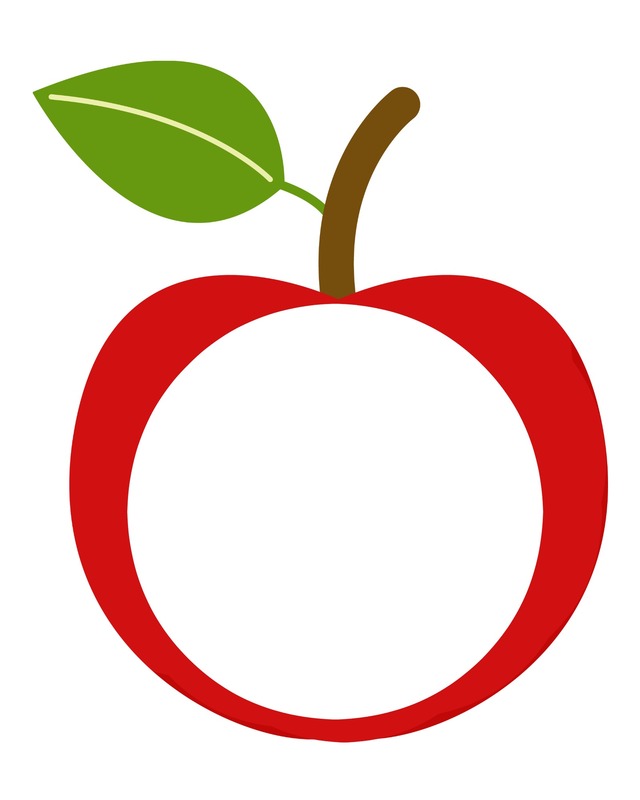 In this post, I’ve included a printable apple template to get you started. From there, all you need is some clear contact paper, cardstock, a heart paper punch and red glitter to pull it together. What are you waiting for? Download the file below and get to work on making a one-of-a-kind mosaic piece with your child today. Happy crafting, my friends! First download and print the FREE template above. 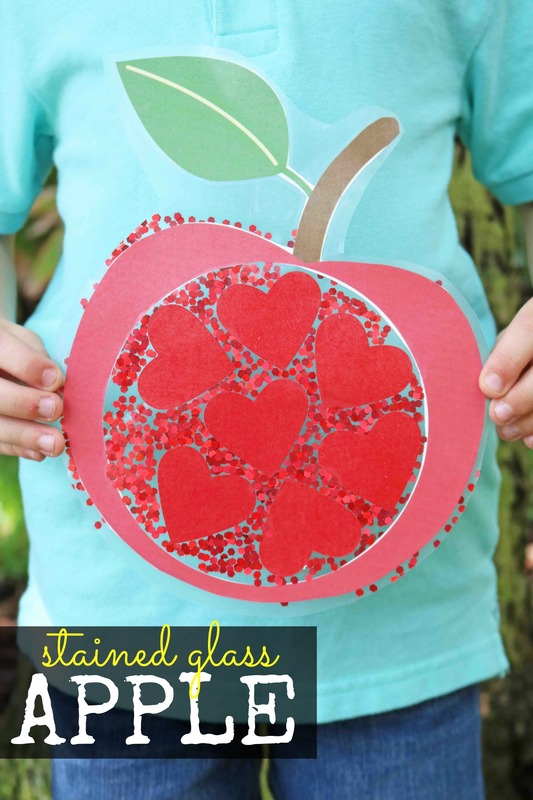 You will want one apple printable per craft. Grab your scissors. Trim out the apple in the printable, as well as the circular center from it. Discard excess paper. Set aside the newly cut out piece. Next grab the red cardstock and heart paper punch. Cut out several heart shapes to be placed inside the apple shape. Now grab your clear contact paper. Cut out TWO pieces that are bigger than the apple cutout. Remove the backing from one piece of contact paper. Lay it on a flat surface, with the sticky part facing up. Place the apple cutout, face down, on the contact paper. 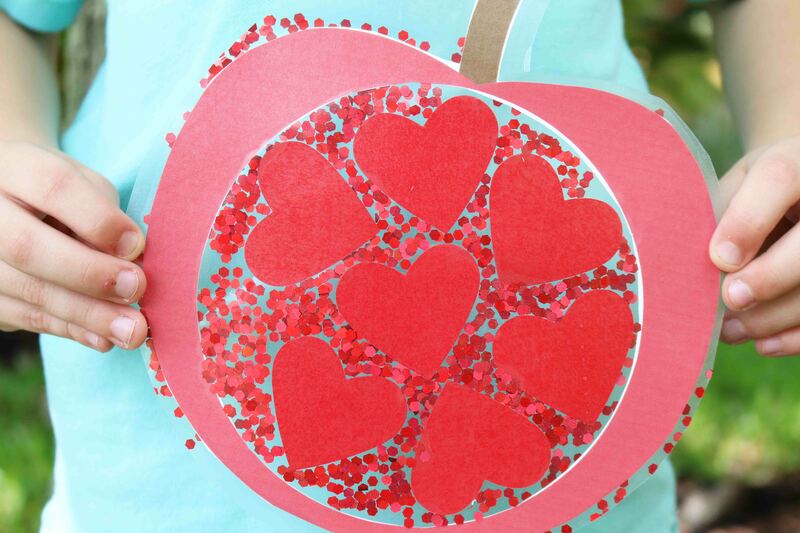 Next have children decorate the inside of their apple with the heart cutouts, as well as red glitter. Once they are done decorating the inside of the apple piece, grab the second piece of contact paper. Peel off the backing off of it and place it on top of the other piece of contact paper, face down, moving your hand around to “squish” everything together. To finish off the Stained Glass Apple craft, use your scissors to trim around the apple/remove the excess contact paper. Now display your piece proudly on a window with tape!!! 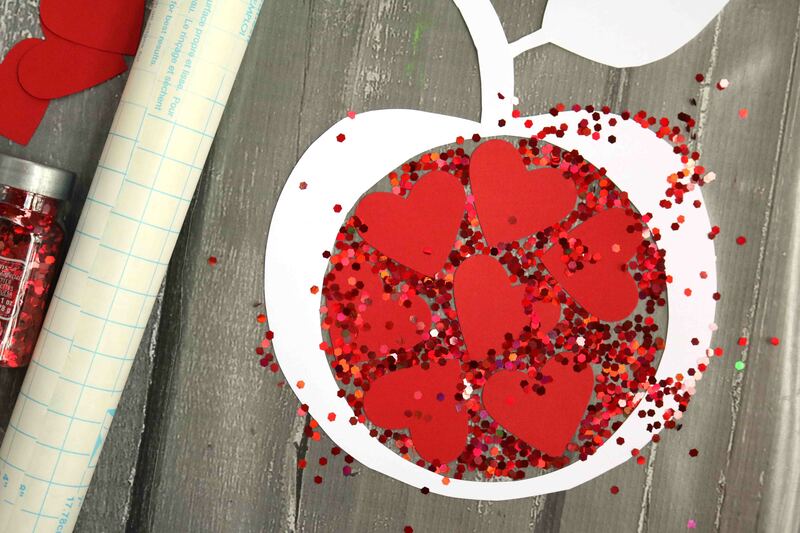 For extra fun on this craft – add a handprint “leaf” to the apple. Simply trim off the small leaf in the original apple printable with scissors and follow the same steps above, but add a green handprint cutout where the original leaf was. This is a great step to add that “keepsake” touch!